Grand Piano by Jacob Bertsche. 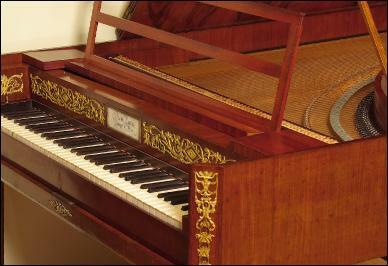 Manufactured circa 1812, this is a rare example of a Viennese grand piano that would have been familiar to the great composers of piano music in the classical period. 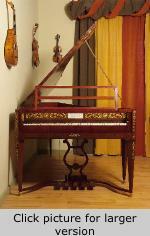 The fine mahogany case with applied gilt metal decoration is 220.5cms. long by 117.5cms. wide. The compass is FF-f4 with bone naturals and ebony capped accidentals. The piano has five pedals controlling Bassoon, Keyboard shift, Moderator, Semi-Moderator and Damper Lift.